5-axis machining uses CNC technology to simultaneously move a workpiece on five separate axes. It is an advanced process, ideally suited to parts with complex shapes. 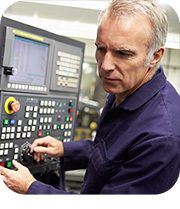 All Craft Manufacturing is a regional leader in 2, 3, 4 and 5 axis machining. The most advanced of these, 5 axis machining, has become the process of choice for many applications, in part because its single set-up machining reduces lead times, also because tilting the tool in order to maintain the best cutting angle lengthens tool life. With CNC machines, there are always multiple ways to achieve the desired result: a 3+2 axis, for example can deliver the same quality as the most advanced 5-axis system. To achieve the greatest process efficiency at the lowest cost, however, your best “tool” is a CNC expert who understands all 7 aspects of the project: the machinery, the software, the work envelope, featuring, tooling, part geometry, and material. He (or she) also needs a thorough understanding of how to apply software tools to simulate the process, making certain that toolpaths are smooth, crashes are avoided, and scrap will be near zero. He can then walk you through the various options, discuss the differences between them (speed is usually a major one) and offer recommendations. This is truly the All Craft Advantage. Our extensive experience with all types and generations of CNCs gives us the ability to help you make best-possible-decisions when it comes applying CNC technology to critical manufacturing tasks.